The 13th edition in a series of posts that highlight one Expert Author who has achieved success by doing just one thing exceptionally well. Two words: Value-Driven. 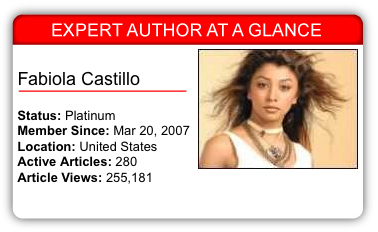 That’s how Expert Author Fabiola Castillo describes the force behind every article she submits to EzineArticles. Each article must provide readers with valuable information they wouldn’t be able to get anywhere else, or she isn’t satisfied. If she wants to cover a topic, but isn’t satisfied with the value of the information she’s providing, she’ll do research and come up with a fresh angle before writing anything. According to Fabiola, there isn’t one single “Secret To Success” she’s learned to define her article writing and marketing experiences. She says, “Just like any writer, I research what I want to write about and start writing.” She continues, “I have to add that producing one tiny article simply won’t cut it. You have to write consistently if you want to gain credibility with the public.” Fabiola tests her writing strategy with article sets and she periodically evaluates her strategy for improvements. She quickly learned that the best way to get pre-qualified traffic back to her website is to write on subjects where she has other content to offer. “The customers motivate me to keep writing until someone starts noticing me or my store and what I have to sell,” she says. She wants to help her audience and get noticed by sharing valuable information. Getting noticed means she gains some respect as an expert and finds new customers. The Power of Research – Just because you don’t have something worthwhile to say on a topic now, doesn’t mean it’s off-limits to explore and write about in the near future. Research can help you discover basic information about any topic and also provide the small details that’ll make your articles valuable to others. Provide Real Value With What You Know – You set yourself apart with your unique selling proposition. Your approach works for you, makes you unique and should have true value to others. Share that value in your articles. Evaluate Strategy – Being open to evaluating your writing strategy will ensure you are doing all the right things. Stay aware so you can change course if something isn’t working well. A Mentor’s Influence – A mentor can help you step back from your writing and see your entire body of writing and how it fits together. They can provide insights and help you work on overall strategy. Use all of these insights today to write your next value-driven article set. Also, leave a comment for Fabiola. She’d love to hear from you. What’s more, yet another set of great golden nuggets to take away from the EzineArticles family thanks Fabiola. See what I din’t know when it comes to research is its isn’t that difficult as most of these topics have already been covered and covered well by someone. Infact it has already been said in the tips from the EzineArticles team and that’s another thing, being aware as you say, keeping up o speed with all the tips in the EzineArticles back office all you have to do really is to find a niche and write an article in your own unique way – that’s all there is! I believe it’s sometimes just lack of focus and discipline if not downright laziness. It’s just about taking what you have learnt and putting it on paper. Having said that, I need to pull my own socks when it comes to that. 100 challenge, watch me! The power of research and putting that into my strategy was a given, but I never thought about getting an outside view on my articles. Thank you for this insight. Hi Fabiola (beautiful mediterranean name, BTW), it was inspiring reading about you.I am somehow new to this, allthough have published a few ezines, but want to keep improving.I have signed up for the 100 article contest and your tips on adding value and previous research are great.My barrier is language, as I do write quite often in spanish but writting in english has its limitations for me…normally my brain goes faster than my words and often stop by the dictionary…but I will get better! I agree, get on Fabolia, well writen, packs a punch !! I loved this article. I also publish articles and a Blog: Daily Oats, all within the Horse industry. We make and sell Horse Hair jewelry plus more things out of horse hair then you can image. However, at times, it is hard to figure out what to write about. Your article gave me several more ideas to work on. Thanks for the great post. Being an expert author, I don’t use EzineArticles for marketing purpose till now. But in my recent I included my links and results were amazing! I have been writing articles but seem to have run out of steam. My level of knowledge is in computers yet I have trouble selling even one thing. The site is supposed to be an affiliate site. I am trying to keep it up but am running out of ideas what to write about. I have no mentor. I’m not sure how to get one. I am even thinking about giving up. All I get is spammers. Dennis, have you joined any Forums? I would suggest that you join the Warrior’s Forum. You’ll get to know other marketers and the people are always willing to help out with information, encouragement, and advice for you. Some very big named Internet Market guys hang out there and are always willing to give back to the community. Try this and see if it helps you. Best of luck AND don’t give up!!! Thank you Fabiola for your insights. I have been considering a few related topics that I want to explore – education curriculum cycles and the effect on each generation’s grasp of grammar etc. Your energising words have given me a push in the right direction! Wow Fabiola, keep up the good work. And one more thing ” Eres muy bonita”. Thanks so much for taking the time to share your insight in article writing. It was very concise and easy to understand. I will definitely take it to heart, seeing that you are a seasoned veteran! Thanks for the short yet impactful tips! I am a newbie on articles writing but I’ll prove to myself that with enough research done, I can be as competent as any existing writers’, if not better. I just need time to get there ….. Thanks for the tips and I will look to implement them right away. Thank you for the great insights. I also would like to add that the relevance that caters to the immense curiosity of the readers contribute to traffic. The topic you write are on personal security, this is currently a hot issue with everybody because of global threat to our personal safety. I have a great pleasure of having an opportunity to read and study your valuable advice which directed my writing more effective. If I could have your assistance in clarifying certain aspects in my writing through your vital mentorship, I consider it as a great asset I could gain to proceed with my writing with my ambitions. It was very good and easy to understand. Thank you for your insight. I’m always interested in hearing someone’s point of view for marketing. I also agree with you on the article writing and believe that all of us should write everyday. The information you shared was great and we all need to “hear” it. As I have just started in article marketing I found this very interesting reading. I’m going to try and make more time to do more articles my first aim is 10. I totally agree with doing research on chosen subjects. I am interested in different ways to earn money on the internet and this is one way of helping me achieve that. That was an awesome article or research. Interactive and easy to understand at the same time. Good luck for future.